For most people, leaky pipes mean calling a plumber and then their insurance agent, and not necessarily in that order. But in Cairo, so much water is flowing from leaky pipes that it’s causing 1,000-year-old mosques and other historic sites to sink. Enter Brook Muller, an architecture professor in the UO’s School of Architecture and Allied Arts. He and several colleagues from around the world put their heads together when they heard about the sinking mosques — some dating from the 11th to 13th centuries — and started working on a plan. With the diversion of water, they could not only potentially save the mosques but also create a green space that could revitalize two neighborhoods that had seen better days. Muller, a specialist in ecological infrastructure and water-centric design, thinks cleaning and diverting the water could transform a state-owned, 10,000-square-foot strip of land — now a garbage dump — into the heart of a thriving, community-based neighborhood. The word that Muller uses to describe the situation of historically significant mosques and domes sinking in Cairo is an unexpected one: ironic. 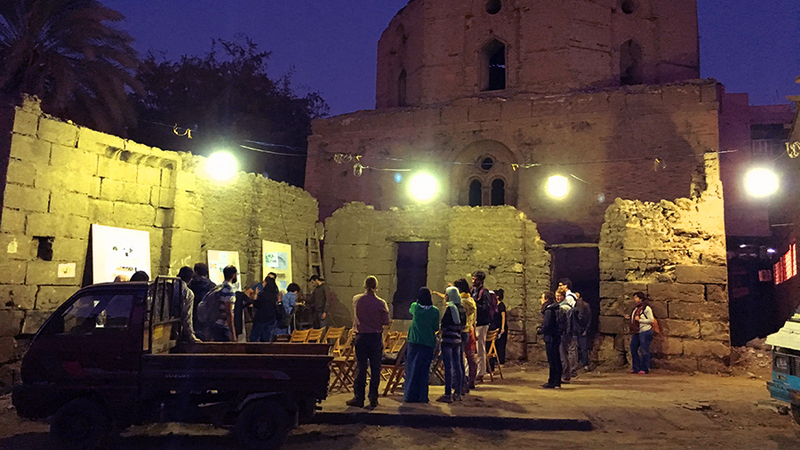 The project began to take shape when Muller was invited to a workshop in Cairo and met May al-Ibrashy, a historic preservationist. Al-Ibrashy was talking about the Ibn Tulun Mosque, the oldest and largest in the city, completed in 879 A.D. and big enough to hold up as many as 30,000 worshippers. She had been restoring several shrines in the Al Khalifa neighborhood near Ibn Tulun, but over time most of them had slipped below grade as the city built up around them over the centuries. As a result, historic holy sites, including the 12th and 13th century Al-Ashraf Khalil and Fatima Khatun domes, were sinking and becoming damaged because near-surface bedrock gave water leaking from pipes no place to go. The middle and upper classes have fled Al Khalifa and moved to gated communities, Muller said, and the neighborhood has seen better times. There’s a lot of poverty. Al-Ibrashy views heritage conservation as a means of bringing tourists back to the area and the significant monuments it contains, thus revitalizing the neighborhood. To save the mosques and domes, excess water would need to be pumped out. But the water itself is not potable. It smells and is actually gray, most likely full of pollutants. Intercepting it only to channel it to the sewer system was not a solution, as it would only send the problems downstream. Instead, through extraction, treatment and storage, it could be put to productive use. The solution came in the form of a narrow strip of abandoned land situated between the Zaynhum and al-Kalifa neighborhoods, a site routinely used as a dumping ground and a place for illicit activity after dark. The water could be rerouted to that space, feeding gardens that would serve as a “green lung” to help filter the heavy pollution that lays over the city. It would turn an eyesore into a thriving, beneficial space for both neighborhoods. Al-Ibrashy partnered with Kareem Ibrahim, an urban development consultant who had been working on housing for Syrian refugees on the outskirts of Cairo. Muller contacted water engineer Meg Prior and environmental educator and project ecologist Josh Cerra, an assistant professor of landscape architecture and director of undergraduate studies at Cornell University, both of whom Muller had worked with before. The team, aided by small grants from the U.S. Embassy, the American Research Center in Egypt, the Egyptian Ministry of Antiquities and the Cairo Governorate, chose an approach that may seem obvious but is often overlooked: They talked to the communities on both sides of the potential park about what they wanted to see it evolve into and what the needs of each community were. The result was an engagement between the project and the residents that not only provided several solutions and options but also strengthened community bonds. Muller and his team developed four different scenarios for the strip. They included a place for women’s sports — a rarity in Cairo — and a children’s playground, shops, microgardening areas for families and a seating area and cafeteria. A small charge would be required to enter the space, which would then contribute to its upkeep and security. The survey of the project uncovered centuries-old cisterns that could be used to store water, but it also revealed an odd problem for the desert: too much water would still remain, even after the proposed development took place. Muller and the team went back to work thinking about the potential for reuse and realized the graywater could be used by a statuary not far away as well as in car washes. The team has installed instruments that will test how polluted the water is and what it will take to treat it for reuse. Now that the assessment phase is complete, Muller and the team will wait for approval from the Egyptian Governorate to move forward. In the meantime, the team has been shortlisted for a United Nations habitat grant, and Muller and the team are considering other funding options as well. But it all takes time, he said. When and if approval comes, Muller will head back to Cairo to see the project to completion. He’s optimistic, but also wary.